Does your driveway look more like an old abandoned road then it does a driveway? Is the exterior of your building dirty and covered with dust, grime, dirt, or algae? Power washing can quickly restore the like new appearance of exterior surfaces on buildings, concrete, brick, or stone. Trust your power washing needs to a team of proven professionals. Signature Painting Company is a top-rated power washing contractor based out of St. Louis, Missouri. We specialize in power washing concrete surfaces and building exteriors. 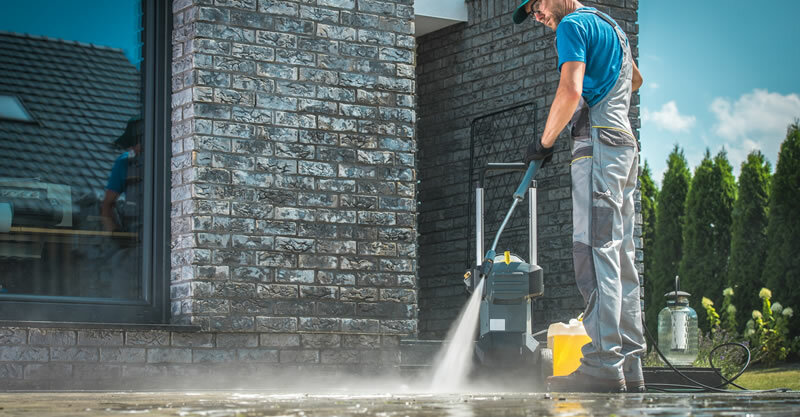 Since starting the business in 2001 we’ve completed power washing projects for hundreds of customers so you can be confident you’re hiring a trusted professional. Why Should You Power Wash Your Home Or Building? Constantly exposed to mother nature and her elements the exterior of your home or building is always vulnerable. Mold and mildew spores, algae, pollen, tree sap, bird droppings, soot, and other pollutants blow through the air and attach themselves to the siding and other surfaces around your home or business. Over time, dirt and grime build up, the mold, mildew and algae start to fester and spread. Patios, sidewalks, driveways and decks can literally become slippery and dangerous when wet. Quickly this starts to degrade not only the appearance but the integrity and value of one of your biggest investments. Hiring an experienced contractor proficient in utilizing both systems will ensure superior results. Why Choose Signature Painting Company For Power Washing? When you choose to hire Signature Painting Company to power wash your exterior surfaces, home, or building you’re partnering with a team of professional painters with decades of combined power washing and exterior cleaning experience. We’ve been in business since 2001 and have completed power washing projects for hundreds of residential and commercial clients. Owner (Matthew Laws) is present on every project and takes great pride in the work that Signature Painting Company completes in our customers homes. We care about your power washing project and we want to make sure we do the best job we possibly can. We provide unbeatable value, we keep your property spotless, our pricing is fair, and the quality of our finished work is unmatched. If you’d like to schedule an estimate for your power washing project then give us a call (618) 580-5736 or fill out our online contact form and we’ll get right back you.